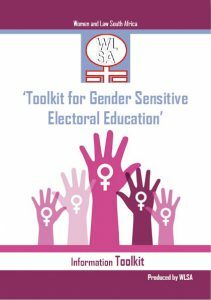 WLSA is an organisation which aims to contribute to the socio-economic, political, and legal advancement as well as protection of women and girls. This is achieved through strategic action research in the socio-legal field, lobbying and advocacy for legal reforms, policy changes, laws (including Swazi law and custom) and practices which discriminate and disadvantage women and girls. A Swaziland where justice is equitably accessed, claimed and enjoyed by women and girls in all spheres of life. Promoting the empowerment of women to participate in leadership and decision making positions. Empowering women and girls through provision of legal rights education and training. .
WLSA has six programs with action research being the core program; the others being Information Generation, Legal Advice and services Lobbying and Advocacy; Networking; Training and Education. WLSA conducts activist research in the even countries. By activist research we mean research which is intended to inform and influence action being taken to improve women’s legal position and which incorporates action into the research by educating women about their legal rights, providing legal advice, questioning and challenging the law as well as instigating campaigns for changes in the law in the course of research. The research program is carried out in phases during which all the seven countries choose a research topic. Research in planned collectively by the researchers in the seven countries, and the results are compared at the regional level. The following research topics have been studied by WLSA; in 1990-1991, Maintenance Law; in 1992 to 1993, Inheritance Law; 1994-1996; Family and the Legal Status of Women In the Family; the Administration of Justice; Delivery Problems and Constraints is the research topic for 1997-2001. WLSA research is done collectively by multidisciplinary teams of 6-8 persons in each country, two of whom are employed fulltime by WLSA while the others are employed elsewhere in jobs related to WLSA work and do the research part-time. This structure is designed to ensure that WLSA research findings are immediately incorporated in the work of the researchers, and that the researchers’ experience in different fields of women and development and the law are incorporated into the research that WLSA does. WLSA research investigates both customary law and general law, and the interaction between the two. WLSA takes the perspective that the official customary law of Southern African states is a rigid skewed and sometimes distorted version of the actual customary law at the time when it developed which often a little to do with the lives of the people in whose name it has been applied. We believe that the historical roots of customary law must be uncovered and a fresh analysis of women’s rights must be made. We also attempt to rethink legal concepts to ascertain their true nature in customary law and women’s position in that system. We find it necessary to study today’s customary law, as it is applied in semi-autonomous social fields not directly regulated by the state, such as the family. The program undertakes the marketing and distribution of WLSA’s research reports, repackaging them in various languages and disseminating the research reports to different target audiences such as academics, students, NGO’s, policy makers and the wider public. The research results are used to influence the legal and policy environment, in respect of women and the law. Being activists as well as socio-legal researches we use the information generated to encourage all governments in the SAC region to make legal changes to benefit women. Networking is achieved at the national, regional and international levels through a quarterly newsletter, workshops, conferences, and seminars. Training and Education on Women’s Rights as Human Rights through the formal and informal courses. WLSA generates public interest in and knowledge about the issue of women and the law through legal education and information dissemination. All the seven WLSA countries fall under the WLSA Board of Trustees and the WLSA Regional Office in Harare, Zimbabwe. Who are our Key Stakeholders? WLSA has good relationships with key stakeholders. This is a strength the organisation will build upon going forward. No one organisation can work in isolation and, with limited resources, a group of organisations can accomplish more than anyone of them alone. Some organisations WLSA is going to engage with include Government, CANGO, NGOs, LutsangolwakaNgwane and private sector companies, among others. Funding partners are key stakeholders of WLSA. WLSA Swaziland is currently being supported by the Catholic Aid for Overseas Development (CAFOD). CAFOD has invested in the turn round of WLSA and is currently supporting capacity strengthening of the organisation as it begins to implement the new strategy 2015 – 2019. It is envisaged that this support will continue through the current strategy period.